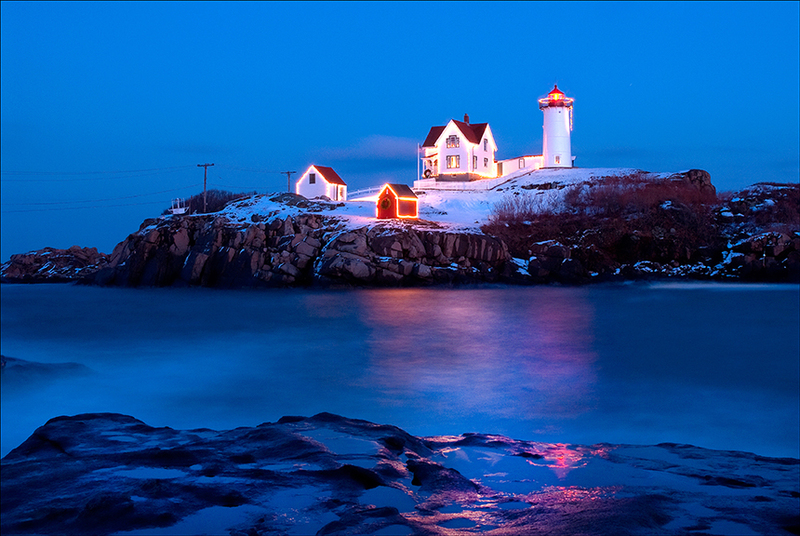 Nubble (Cape Neddick) lighthouse lit up for the holiday season. 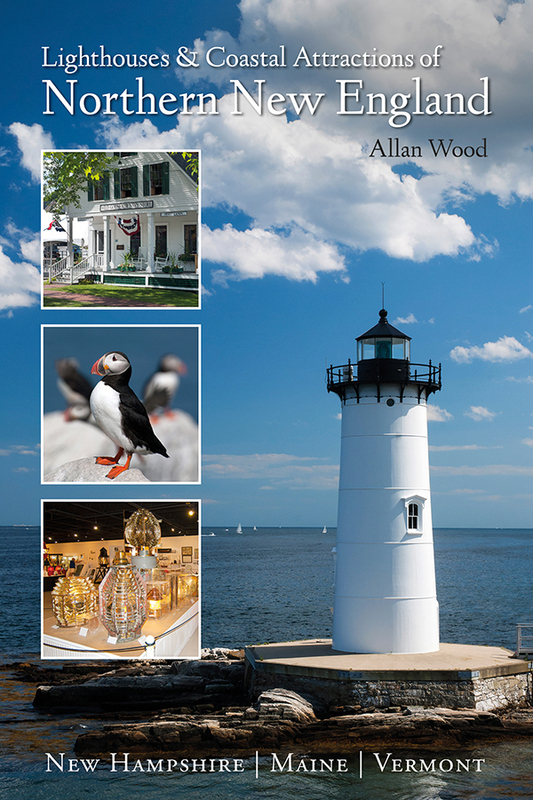 During the holiday season in New England, lighthouses are draped with wreaths all along the coast, while some have decorated lights to illuminate the towers. Nubble lighthouse, also referred to as Cape Neddick light, is one of the most decorated beacons on the coast, York, Maine. The tower is decorated with special lights along with the adjoining keeper’s building during a special festival, put on during the weekend after Thanksgiving, named as the “Lighting of the Nubble.” Each evening, at dusk, the lighthouse illuminates until the holiday season ends and is a great tourist attraction and a special attraction for the locals as well. Check this great annual tradition out if you’re in the area and join the locals for some fun and festivities! Santa usually shows up as well. What? You can’t make it for this holiday celebration? Don’t like the cold? 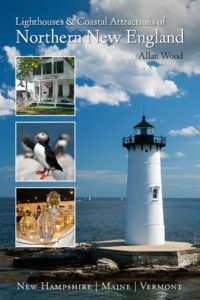 No problem, there is also a “Lighting of the Nubble” celebration in July six months later each year! Note: During the free nubble lighting ceremony on the last Saturday of November, the park area will be closed to vehicles so everyone can relax and enjoy the view without worrying about traffic. 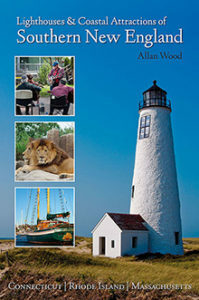 Free shuttles will be offered to bring people from two designated locations, at York High School, and the Short Sands parking lots, beginning at 3:30 p.m., to Sohier Park to view the lighthouse. There is a handicapped accessible shuttle available only at York High School. Dogs are not allowed at this event. Brightly lit holiday tree made of lobster traps and fishing gear displays in front of lighted Nubble lighthouse for the Christmas season. Let’s get back to the current holiday season. There’s another more recent tradition sprouting along the New England seacoast where coastal communities are engaged in friendly competition in building holiday Christmas trees made of old fashioned wooden lobster traps and fishing gear, or wireframe lobster traps and gear. Some communities boast having the tallest, some the most decorative, while most are just happy to create a local joyous tourist site, like the one near Nubble lighthouse, in honoring those that make a living by the sea. Decorated traps are erected into a large familiar conical shape, and most are lit at night for visitors to enjoy. 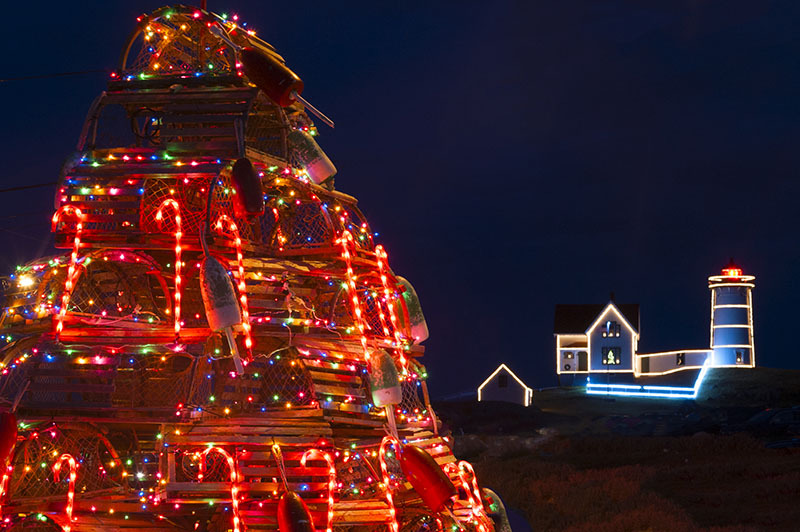 You’ll also find, at Sohier Park, where you would go to enjoy nice close up views of Nubble light, a lobster trap Christmas tree made of old wooden lobster traps and fishing gear that also lights up in the evening to join the beacon’s illumination. It is located in the parking lot of Fox’s Lobster House restaurant. For those that want to look around, you’ll also find lobster trap holiday trees in Gloucester, Massachusetts, where the tradition was born nearly 20 years ago, and in Kennebunk, Maine, by the Fire station for starters. Have a wonderful and safe holiday season, and drive around to enjoy the lights!